Cherry Grove South Carolina is our specialty. Our team is committed to making the buying and selling of condos in Cherry Grove, SC a pleasurable and rewarding experience. 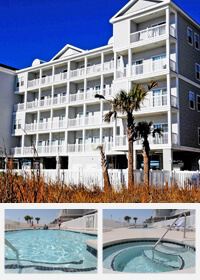 Our website allows you to search all active Cherry Grove condominiums for sale. It is easy to use and navigate through condo searches. You can also save searches and get daily email alerts of new listings as they become available. Located in the northernmost section of North Myrtle Beach, Cherry Grove Beach condos for sale are away from the crowds and clamor of Myrtle Beach, but still convenient to all the world-class attractions found there. And, of course, they're extremely convenient to the many world-class attractions found in North Myrtle Beach, not the least of which are the amazingly beautiful sands of Cherry Grove Beach itself. With a variety of great condos for sale in low-rise, mid-rise and high-rise buildings, the options for anyone wanting to buy a condo in Cherry Grove Beach are good no matter the features or budget desired. At the heart of Cherry Grove Beach is one of the Grand Strand's most notable landmarks, the Cherry Grove Pier, a great place to fish or just people watch. Some of the Grand Strand's best golf courses are just minutes away, including the four courses of Barefoot Resort designed by Pete Dye, Greg Norman, Tom Fazio, and Davis Love III. And, of course, the acclaimed Barefoot Landing with more than 100 shops, restaurants and entertainment venues is just minutes away as well. Laguna Keyes offers 1, 2, 3 and 4 bedroom condos featuring full kitchens, stone countertops, washer/dryer, ceramic tile floors, floor to ceiling glass, oceanfront balconies with unique transparent bannisters, and much more. Amenities include an oceanfront pool surrounded by terraced sundecks, hot tubs, lazy river ride, kiddie pools, and an oceanfront fitness center. 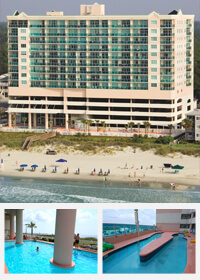 Sister resorts located in North Myrtle Beach. Prince Resort's 1, 2 and 3-bedroom condominiums feature ceramic tile flooring, garden tubs and granite countertops. Units also feature laundry rooms, full kitchens and high speed Internet. Amenities include 2 swimming pools, a unique rooftop Lazy River, Jacuzzis, modern fitness center and much more. 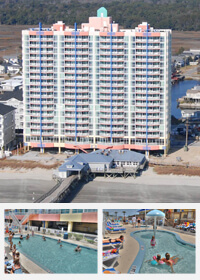 A bonus amenity of the Prince Resort is the fact that it's located right next to the iconic Cherry Grove Pier. Designed for large groups with 6 bedrooms on 2 floors, Pier Watch Villas can accommodate groups up to 20. Amenities include swimming pools, an oceanfront pool and Jacuzzi. Room amenities include a private balcony, waster/dryer, and a fully-equipped kitchen with extra large refrigerator. Extra large rooms, and high speed Internet are other features as well.